UK May wheat futures continue to trade within the same tight channel of the last four weeks between £137.50/T and £140.00/T, mostly driven by currency and political changes but lacking any significant change in local or global supply and demand, so is currently trading at about £139.25/T - about the median for this calendar year. It would be unusual to have a Spring without a crisis somewhere in the world (that will add a bit of spice to the market) but it has not happened yet. UK wheat exports for December were their lowest monthly level since July, at just 25,000T, with imports reported in excess of 115,000T. There is still plenty of wheat in the South, and the grain trade are making plans to transport it up North. With uncertainty on the date for recommencement of Ensus bioethanol operations the UK wheat balance sheet is growing larger by the month, adding pressure on forward carries so the wheat price is flat-lining. This leaves nearby values, though low, still looking as attractive to growers as the price for July, so UK May futures are currently at £139.50 whilst July is just over £1 higher. However there is a carry of £4/T from May to November. The monthly French wheat S&D update from France AgriMer reduced French wheat production from 37Mln T to 36.6Mln T and the lack of wheat exports increases the French carry out by 0.37Mln T to 3.25Mln T. EU to EU wheat exports have been slightly reduced from 8.61Mln T to 8.45Mln T, while exports to non-EU countries have been reduced from 9.3Mln T to 9Mln T, so overall reducing total exports by 0.46Mln T. European cash prices are firm as a result of the successful tender to Saudi, and Russian wheat prices have been rising – possibly because all the wheat local to exporting ports has dried up and exporters are using a longer cast. Russian wheat exports are 60% higher than last year so they remain the driver and benchmark for all other origins; it is likely to break the 34Mln T world record for wheat exports set by the US in 2010/11. 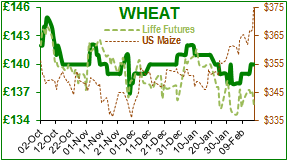 US wheat has seen little action and is trading in an overall low band driven by currency and lack of exports. Pressure is increased further by the likelihood of rain forecast over the next few weeks within the Eastern portions of the winter wheat belt. The soyabean markets show strong gains this week with March soya futures closing at $9.83/bushel last Friday and trading at $10.25/bushel today; in mid-January March soya was trading at $9.50/bushel. Funds activity remains a strong driver in this market. On 16th January the funds were 19Mln T short of wheat, 29Mln T short of maize and 14Mln T short of soya; as of the 6th February they were 11Mln T, 10Mln T and 1Mln T short respectively, which shows that the funds have reduced their bearish bet, reducing their liability to the upside and lifting prices at the same time. Soya beans reached 9-week highs on the March contract and soya meal rose about $50/short ton in 10 trading days. Trade focus remains on the dry Argentine weather, currently showing reduced probability of rain therefore continuing the risks of the drier than normal conditions into early March. This is adding to trade concern and reducing willingness for farmers to sell due to uncertain crop size. BAGE unexpectedly left crop estimates at 50Mln T yet reduced the quality of the crop rated poor/very poor from 20% to 56% which does not support the idea that yields will be unaffected. US exports remain lower than last year with the USDA predicting a 3.5% decline. A record US crush of 4.5Mln T for January was released by NOPA, still below the trade expectations. A trade survey of US farmers indicates that the soya bean acreage will increase at the expense of maize, so the battle of the acres has started, with predictions showing a soya acreage increasing by 1.5% to 91.5Mln hectares. US wheat plantings for 2018 are forecast to hit a low of 45Mln acres, the lowest since records began in 1919.